Deputy Commissary General William Henry Drake, C.B. (1812–1882). No part of these web pages can be copied or used for commercial purposes or gain without permission. The contents of these pages can be copied and quoted for personal and academic purposes provided that Megan Stevens and the Crimean War Research Society website are acknowledged as the source of the information and that no resultant document or publication is made available for commercial purposes. 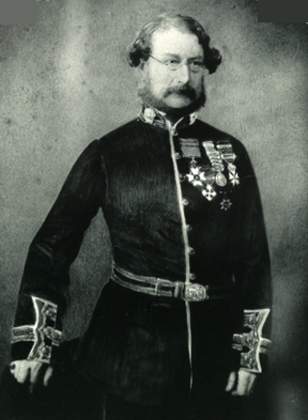 The Drake Letters are transcriptions by Megan Stevens of the letters written by Assistant Commissary General William Henry Drake whilst en route to Crimea and from his posting at Balaklava as well as letters from his wife once she joined him. The letters are complemented by extracts from William Henry Drake's Journal, newspaper articles and official documents. Above left is the main table of contents, followed by the Drake 'family history' page and sub sections. The main table has links to Megan Stevens' introduction and conclusions, plus Drake's career and background pages. Below are the transcriptions of the letters themselves and a number of pertinent newspaper articles. The blog is well worth following for fascinating extra and background information about Drake and his family. The main blog entry page https://downrabbitholes.com.au/drake/ provides an ordered list of links to all the detailed articles that are referenced in the blogs as well as a link to allow visitors to download Megan’s thesis.